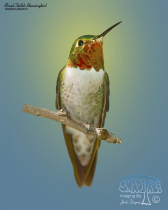 Hummingbirds are among the smallest of birds. They are also the only group of birds able to fly backwards. 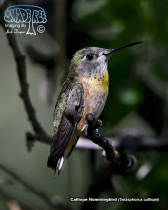 Species shown in this gallery are Allen’s Hummingbird, Anna’s Hummingbird, Black-Chinned Hummingbird, Broad-Billed Hummingbird, Broad-Tailed Hummingbird, Calliope Hummingbird, Costa’s Hummingbird, Magnificent Hummingbird, and Rufous Hummingbird. The Allen's and Rufous Hummingbirds can be very difficult to differentiate in the field. 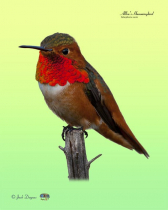 The the Allen's Hummingbird breeds only along a narrow strip of coastal California and southern Oregon. Without a doubt, the Anna's Hummingbird is the most common hummingbird found on the west coast, where in some areas they are year round residents. San Diego County is such a place. 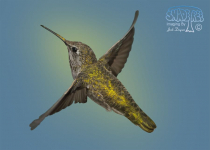 The Black-Chinned Hummingbird can be found at times in most of the Western USA. 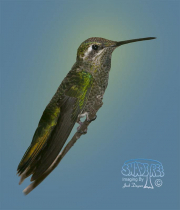 The Broad-billed Hummingbird is a temporary (summer) breeding visitor to Southeastern Arizona. These images were captured in Tucson and in the Huachuca Mountains. The Broad-Tailed Hummingbird summers in the sub-alpine meadows of the Rocky Mountains, sometimes as far north as Southern Idaho and Wyoming. North America's smallest bird has a very long migration. This bird flies from Central America to as far north as Canada to breed. There it often seeks out high elevations to nest. 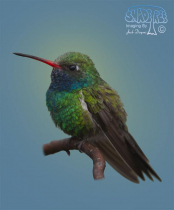 The Costa's Hummingbird is a desert specialist. In the extreme heat of the summer it will look for cooler habitats nearby (up-slope and wooded habitat). 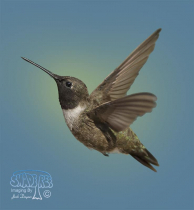 The Magnificent Hummingbird was known as Rivoli's Hummingbird until the mid-1980s. It is rarely seen in the USA except in Southeastern Arizona. 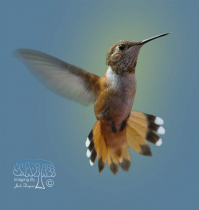 The Rufous Hummingbird has a much wider distribution than its cousin, the Allen's Hummingbird.